A tasty way to use sausages, delicious hot or cold. Sieve flour into a large mixing bowl and add a pinch of salt. Rub butter into flour and salt mixture until it resembles very fine breadcrumbs and add the beaten egg yolk. Add the ice cold water to bring the mixture together. Cover with cling film and rest in the fridge until required. In a large pan sauté the onion, leek, carrot and garlic. Add the herbs and cook for a further minute or two. Remove pan from heat and place contents in a bowl. In the meantime cut the sausages in two lengthways, remove the pork meat from the casing and add to the bowl with the sautéed vegetables, mix well. No further seasoning is required as the sausages are already seasoned. Lightly oil individual ramekins and line with the pastry, fill with the sausage mixture and add a pastry disc top to close. (You can use muffin tins if you don’t have ramekins. Makes 4 pies using ramekins or 8-10 using muffin tray). Bake in a preheated oven 180°C/350°F/Gas mark 4 for 20 - 25 minutes, until golden brown. Chop all of the large vegetables into large slices and chunks. Place in the preheated oven for 6-10 minutes each until they are softened and lightly charred. Transfer to a large serving dish. Drizzle with the lemon juice, balsamic vinegar and olive oil and mix in the crushed garlic. Serve immediately with the pork pies. This is a easy to do &amp; makes something different out if an every day food. 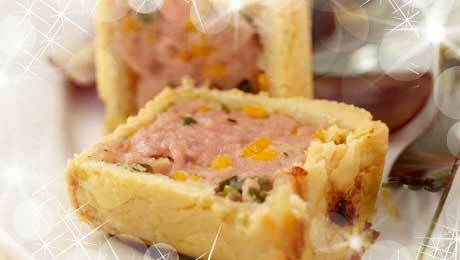 I mixed the sausage meat with some minced pork &amp; chopped rasher to give it chunky pie filling. I would be doing this recipe again. This is lovelly recipe very very filling if I was doing it again I might use bun tin instead of muffin tin as I used veg my family are anti salad so smaller pie would be ideal for veg and potato dinner. I would reccommend but this came up in xmas starters section perhaps in error as far too filling to be starter. Another nice winter meal and kids loved them too.